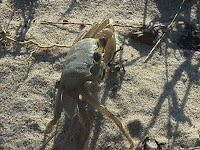 This poem was written in response to the poem Ghost Crabs by Ted Hughes (Wodwo 1967). The March of the Killer Crabs was read by Bill Mandle ... the famous Bill Mandle, at Naytures Table Cafe Moruya on Pink Rock Poet Day 2007. Ken Fry (Neptune), Audrey and son Warwick were present on this celebratory occasion.